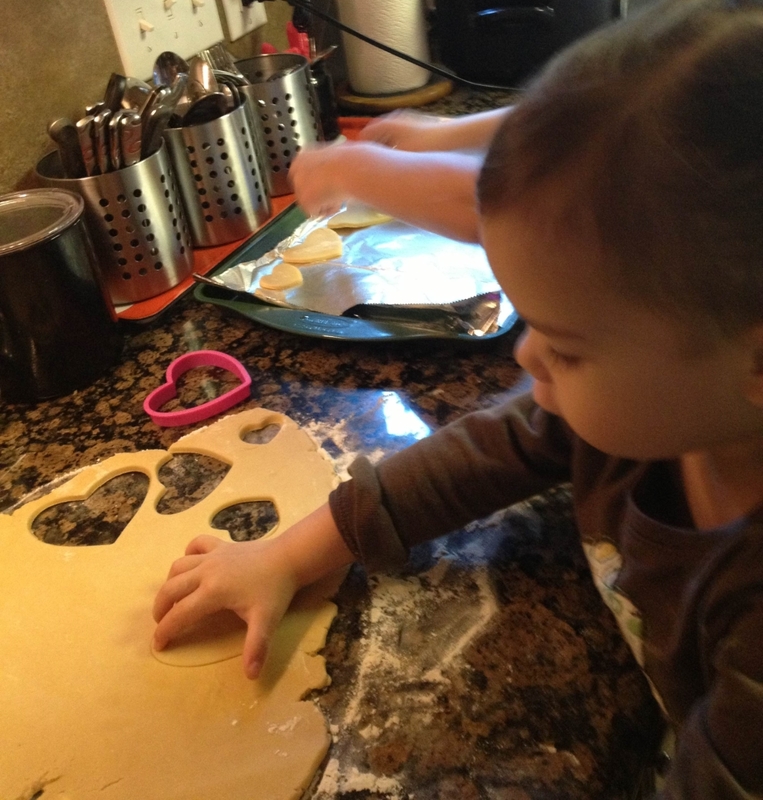 As I mentioned before, baking sugar cookies is one of our Valentine’s traditions. We don’t have many Valentine’s traditions , but we never skip cookies. We have tried several different recipes over the years, and always come back to these– they are addictive! Oldie but goodie from Betty Crocker. If you like store-bought frosted sugar cookies- the thick and fluffy kind– you will love these. I would not recommend skipping almond extract, it adds a touch of extra flavor, not really almondy, but rather adds to the “sugary” quality…you’ll see what I mean when you bake these! They are also pretty straightforward to make: mix all the ingredients, chill the dough in the fridge, roll out and have fun cutting out the shapes. Cutting out and frosting is the kids’ favorite part of the process. Oh wait, that would be the eating! Mix powdered sugar, butter, vanilla, almond extract and egg in large bowl (you can use a mixer or do it by hand). Stir in remaining ingredients except granulated sugar. Cover and refrigerate at least 2 hours. Heat oven to 375ºF. Lightly grease cookie sheet. Divide dough in half. Roll each half 1/4 inch thick on lightly floured surface. Cut into desired shapes with 2- to 2 1/2-inch cookie cutters. Sprinkle with granulated sugar if using. Place on cookie sheet. Bake 7 to 8 minutes or until edges are light brown. Remove from cookie sheet. Cool on wire rack. Frost cooled cookies if desired (always desired in my house). Mix powdered sugar with melted butter, add remaining ingredients. If the mixture is too thick, add more milk a few drops at a time. If it is too thin, add powdered sugar. The frosting gets thick fast. You can add more milk or microwave it for a few seconds to make it spreadable again. Note: to make the cookies softer and “fluffier”, roll-out thicker. To make them crispier, roll-out thinner. 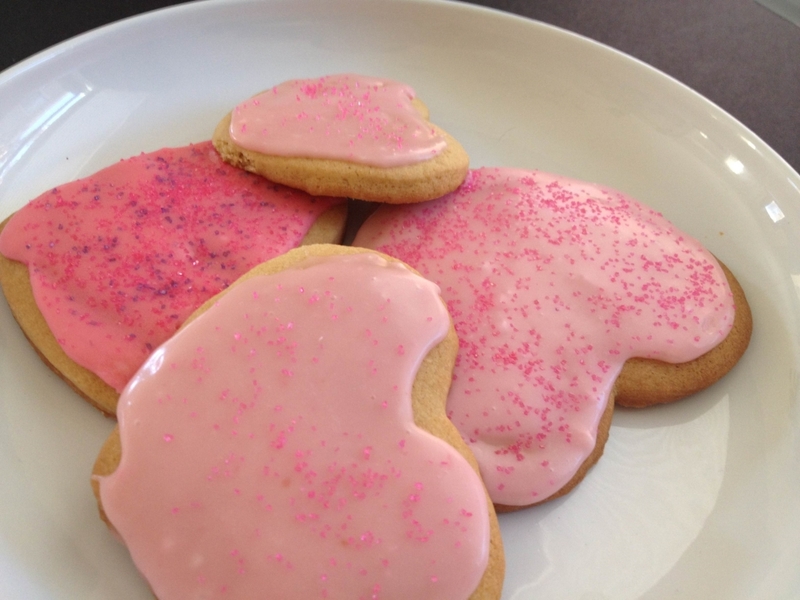 What is your favorite treat to make for Valentine’s? Yum! 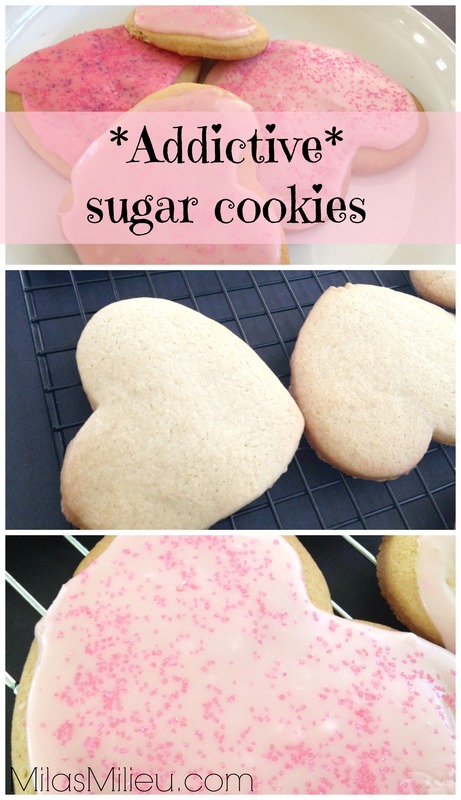 I love sugar cookies- such a fun treat! You will want to keep it, it is so easy to work with and yummy. If it gets too warm to roll out, you can stick it in the freezer for a few minutes. Mila, does the frosting hardens so that you can stack these, or does it remain soft? Thank you! The frosting hardens a bit after about an hour uncovered. I usually store them “piled” loosely in a large Tupperware container. They may stick to each other a little bit but not too much. You can also store them on a large plate, covered with plastic wrap or foil.